Tom Hagen and Peter Clemenza see Neri as a potential replacement for Luca Brasi, Vito Corleone's feared enforcer, and arrange his release from prison. Normally, policemen are barred from becoming made men, but they were impressed enough with Neri to recommend that Michael intercede. Michael, appealing to Neri's sense of loyalty and Sicilian-American roots, recruits him into Clemenza's regime. Clemenza is initially impressed by the ferocity that Neri displays in their first meeting. Neri later "makes his bones" and becomes Michael's chief lieutenant by personally murdering Moe Greene and Emilio Barzini on Michael's behalf. Neri carries out the latter murder while disguised in his old police uniform. After Salvatore Tessio is executed for betraying Michael, Neri is promoted to caporegime of Tessio's former crew, and plays a key role in the wave of murders that reestablishes the Corleones as the most powerful crime family in the nation. When Michael and his family move to Nevada, Neri becomes head of security for all hotels controlled by the Corleones. In the film version of The Godfather, Neri's backstory is not mentioned. He does not say a word in the first film and following Michael's return from exile in Sicily, Neri becomes his bodyguard, accompanying him everywhere. In the famous "baptism sequence," Neri, disguised in a police uniform, guns down Barzini and his bodyguards on the steps of a courthouse, much as he does in the novel. However, the murder of Greene, which occurs simultaneously, is handled by another, anonymous gunman. 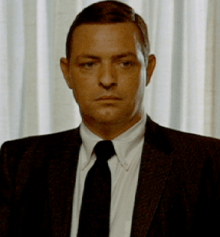 In The Godfather: The Game, Neri is voiced by Gary Chalk. 1 2 Sisario, Ben (February 20, 2006). "Richard Bright, 68, an Actor in the 'Godfather' Movie Series, Dies". The New York Times. 1 2 3 "Richard Bright, 68; acted in 'Godfather,' 'Sopranos'". Associated Press. The Boston Globe. February 20, 2006.